Your picture is seen through a transparent Star of David, creating an eye-catching effect. The titles run in paralel. The English title can be edited in Producer. 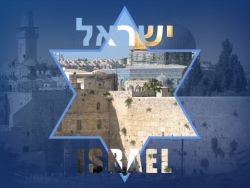 The Hebrew title was created in a graphic editor, and cannot be edited in Producer. It is provided as is, for those who don't have Hebrew fonts on their computer.